And so another year draws to a close. 2013 was a pretty fantastic year for me - I can only hope it was for you too! We threw a little celebration in honour of 2013's passing and 2014's arrival. Because last year's NYE party post is still by far my most popular post to date (thank you, Pinterest! ), I thought I'd share a few details of what I put together! I was hoping to get this post up in advance of the actual celebration, but alas, real life interfered (in the best way possible). Photobooth! This was so popular last year, we had to give it another go. This time, with fun silver faux bois wrapping paper from Target (70% off!) and a little sign made from black card stock and silver sharpie. Paper chains! I made a colourful paper chain last year but this year I wanted to go for more classic colours. 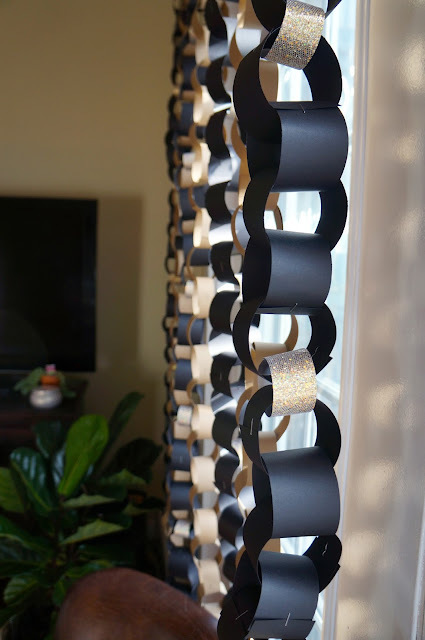 I made 4 chains out of black card stock and gold glitter card stock, and 3 chains out of kraft card stock and hung them directly from the curtain rod. 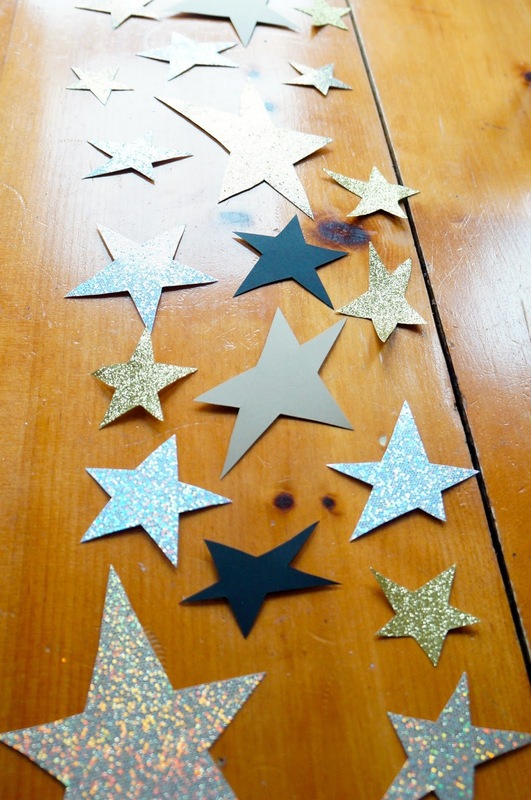 If you're unfamiliar with how to make a paper chain, last year's post has a little how-to. Glitter stars! I had a few of these left over from last year and supplemented them with additional stars from various card stock, which all came from Michael's. I spread the stars down the centre of the food table as a makeshift runner. I also hung some dollar store stars and last year's fringe garland from the chandelier to jazz it up a little. Twinkle lights! We decided to take down the Christmas tree to make a little extra space in the living room, so I wrapped the leftover lights around the bannisters for some ambiance. Flowers! And gold napkins! I also labeled the food with cute little black card stock signs and metallic sharpie. Beverage-wise, we have a fairly awesome (and trustworthy, haha) group of friends, so we used mostly real glasses. After all, I have so many pretty new receptacles, they needed to be shown off! I set out all of the glassware (and a few plastic cups for good measure) and used some pretty milk glass to store straws for those interested. And finally, the reason last year's post got so many hits - the jello shots. Last year I did champagne jello shots with pop rocks on top. This year, we went for vodka jello shots (still with pop rocks!) for a bit more punch. For any jello shot newbies, you basically just make the recipe as usual but replace the cold water with vodka (or champagne/alcohol of your choosing). If you make them - make sure you don't add the pop rocks until JUST before you serve them, as they'll start to disintegrate the jello on contact. Unfortunately, they were gone so fast, I didn't get around to taking any pictures! And that's it! Another year for the record books. I'm so thankful for all of the awesome opportunities and fantastic people I've met through this blog. So cheers to YOU for reading and thanks for coming back! I hope 2014 brings you and yours happiness, health, and plenty of peanut butter cups. 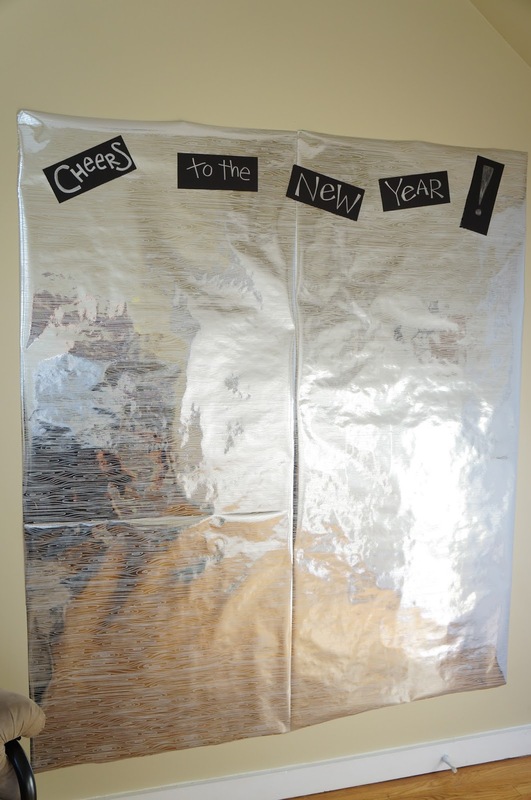 For more NYE ideas, check out 2015's post!